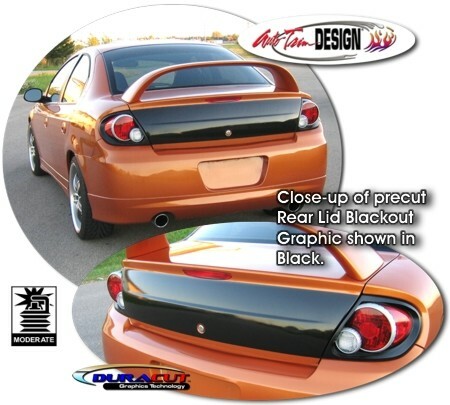 Give your Dodge Neon or SRT-4 a different look with this Rear Lid Blackout Graphic kit. Precut and ready to install in a wide variety of colors - NO TRIMMING required. Graphic kit consists of a prefitted and contoured piece as shown in the image and specifically fits any 2000-Current Dodge Neon or SRT-4 factory rear lid.It will not fit any other vehicle. Graphic is fit to the width of the factory tail lights as shown. Includes easy-to-follow specific online instructions. Please Note: This graphic is very difficult to install. It will be a challenge to the most experienced graphic installer and almost impossible for a novice.